Open and World Class corps will compete head to head at the World Championship Prelims on Thursday, Aug. 8. 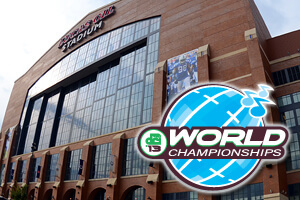 The world's best marching musicians from more than 35 corps will take the field at Lucas Oil Stadium in Indianapolis for this unforgettable event. The top 25 scoring corps from the Prelims will advance to the Semifinals on Friday, Aug. 9. Performance order for the World Class portion of the following Prelims lineup was determined by the average scores from San Antonio (July 20), Atlanta (July 28) and Allentown, Pa. (Aug. 2-3). The Open Class portion will be determined by the results of the Open Class Finals on Tuesday, Aug. 6 in Michigan City, Ind. DCI World Championship Prelims Lucas Oil Stadium, Indianapolis, IN Thursday, Aug. 8, 2013 10:00 a.m. – Stadium gates open 10:20 a.m. – Welcome and Anthems 10:30 a.m. – Blue Saints 10:47 a.m. – Racine Scouts 11:04 a.m. – Les Stentors 11:21 a.m. – Taipei Yuefu 11:38 a.m. – Colt Cadets 11:55 p.m. – Raiders 12:12 p.m. – Legends 12:29 PM - Intermission (34 Min.) 1:03 p.m. – 7th Regiment 1:20 p.m. – Gold 1:37 p.m. – Music City 1:54 p.m. – Spartans 2:11 p.m. – Genesis 2:28 p.m. – Blue Devils B 2:45 p.m. – Vanguard Cadets 3:02 PM – Intermission (34 Min.) 3:36 p.m. – Pioneer 3:53 p.m. – Cascades 4:10 p.m. – Jersey Surf 4:27 p.m. – The Academy 4:44 p.m. – Mandarins 5:01 p.m. – Oregon Crusaders 5:18 p.m. – Colts 5:35 p.m. – Intermission (55 Min.) 6:30 p.m. – Big, Loud & Live 10 cinema broadcast begins 6:40 p.m. – Pacific Crest 6:57 p.m. – Troopers 7:14 p.m. – Crossmen 7:31 p.m. – Blue Stars 7:48 p.m. – Spirit of Atlanta 8:05 p.m. – Blue Knights 8:22 p.m. – Boston Crusaders 8:39 PM – Intermission (20 Min.) 8:59 p.m. – Madison Scouts 9:16 p.m. – The Cavaliers 9:33 p.m. – Bluecoats 9:50 p.m. – Phantom Regiment 10:07 p.m. – Santa Clara Vanguard 10:24 p.m. – The Cadets 10:41 p.m. – Carolina Crown 10:58 p.m. – Blue Devils 11:28 p.m. – Last score announced 12:08 a.m. – Stadium closed Eastern time zone. Times approximate and subject to change. View a complete schedule of 2013 World Championship events.